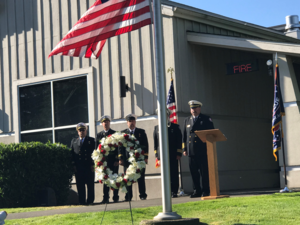 EAST PIERCE FIRE & RESCUE remembers Chief Dan Packer during a commemorative service on July 26, 2018 - the tenth anniversary of the late chiefs death. 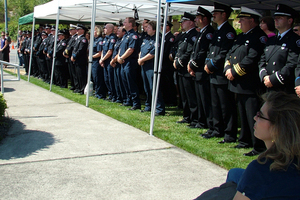 EAST PIERCE FIRE & RESCUE hosted a dedication of a memorial wall on July 26, 2011 at the headquarters station in Bonney Lake. 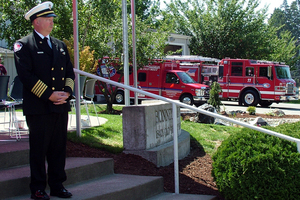 The memorial wall honors the life of Fire Chief Dan Packer and was unveiled during an observance of the third anniversary of the late chiefs death. Packer died in a wildfire in northern California. The 49-year-old chief had just begun a two-week assignment as a division supervisor overseeing wildland firefighters in the Klamath National Forest when the blaze suddenly blew up during a routine survey of the area. 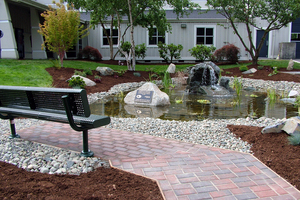 The memorial wall, located at the headquarters station, consists of two display cases that contain items from Packer’s personal and professional life, as well as objects from the accident and subsequent memorial service. 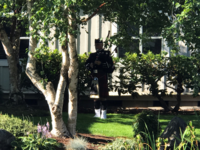 “We are especially grateful to the Packer family for their generosity in loaning us numerous personal items for display,” said East Pierce Deputy Chief John McDonald. 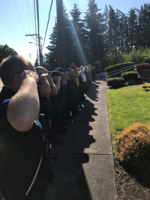 At 8:00 a.m., the public joined East Pierce personnel, family and friends as they gathered in front of the headquarters station, at 18421 Veterans Memorial Dr E. On-duty personnel assembled at the same time in front of their respective stations. 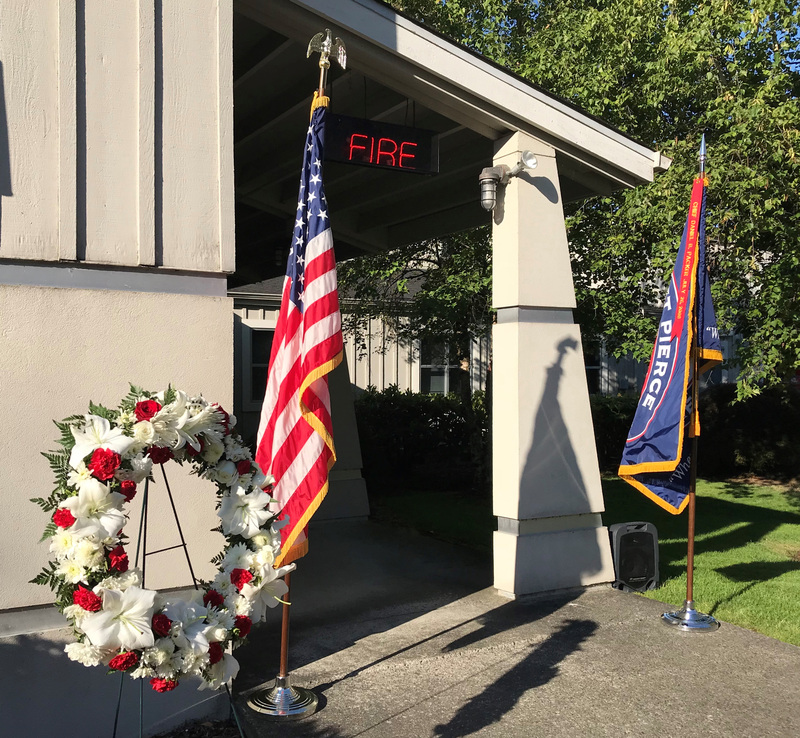 At 8:30 a.m., dispatchers for the fire district broadcast a message to all of the East Pierce stations regarding Packer, ending with a moment of silence to honor him and all fire service personnel who have lost their lives in the performance of their duties. At the completion of the message, all station flags were lowered to half-staff. A reception followed at the headquarters station. 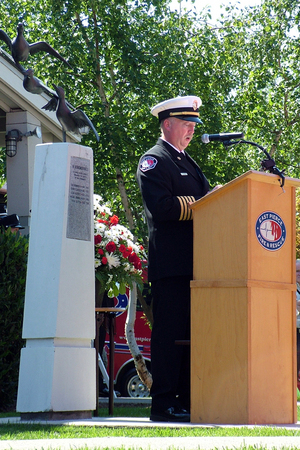 FAMILY AND FRIENDS gathered to attend a dedication ceremony on July 26, 2009 to honor one year anniversary of East Pierce Fire and Rescue Fire Chief Dan Packer's death. 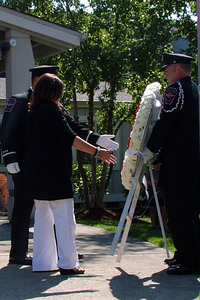 Chief Packer was killed in a California wildfire in 2008. 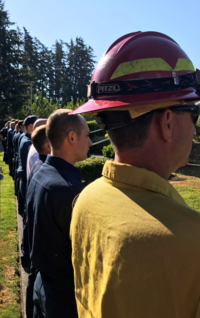 More than two hundred gathered at the East Pierce headquarters fire station on Old Buckley Highway in Bonney Lake to share their memories of the fallen chief, recalling his commitment to the firefighters he led and the communities he served. 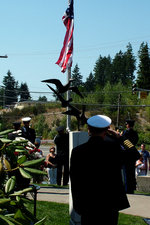 The mayors of both Bonney Lake and Sumner declared July 26 an official day of remembrance. Everyone is welcome to celebrate Chief Packer’s life by contributing stories, memories and photographs at: Packer Everlasting Memorial Page. Please enjoy these photos from the ceremony. To watch the complete video from the ceremony, click here. 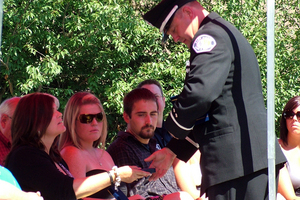 "Chief Packer was a firefighter in the proudest of traditions and we honor his example with this Walk. It is our hope that the names that will appear on the bricks next to his will not only pay tribute to those who have given so generously of their time and energy, but also serve as a reminder to the rest of us of what we can achieve when we dedicate ourselves in service to others. We are profoundly grateful for what you have done, and you will forever be our heroes."